How Many More Can I Make? 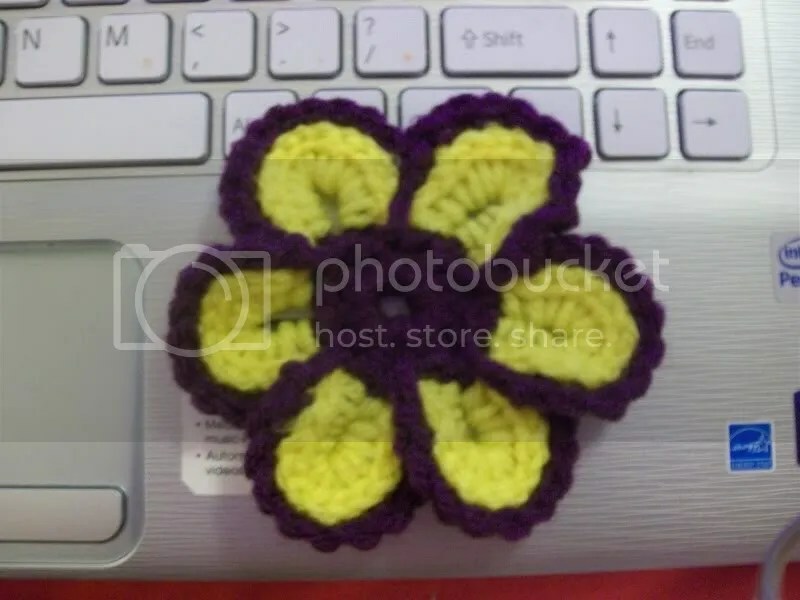 A couple of days ago I found a video on YouTube about how to make a crochet flower, and I’ve been making them whenever I have time. They’re super simple to do, and I’ve finally settled upon a way that works best for me and my crochet technique. There will certainly be more to come, in a multitude of color combinations, thanks to my stockpile of Super Saver yarn. 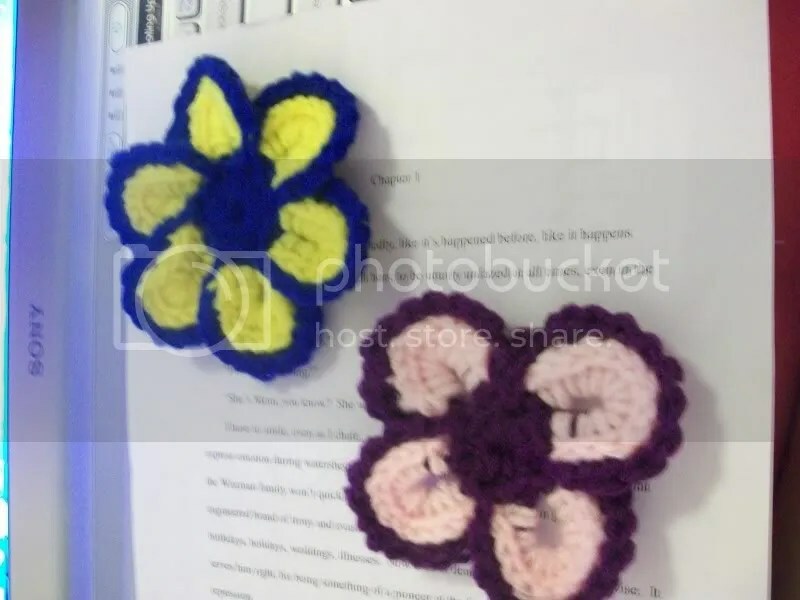 The blue and yellow one is the first one I made, which resulted in my need to learn how to block yarncrafts. I never really believed that pins and water and time could make yarn stay in a designated shape, but I was proven wrong, and I think I’ll be utilizing this technique from now on when something is being stubborn and squishy. The pink and purple one is my attempt at making one that would be less squishy, but i don’t really like the four-petal version it resulted in. It’s cute and all, but I won’t be relying on this version in the future. I made this blue and white one for my suitemate so she would have something to put on her currently bare walls. She wasted no time in putting it up. While I do like the five-petal version better than the four, I think this will only be an occasional occurrence in my flower collection. This is the one I will be sticking with from now on. 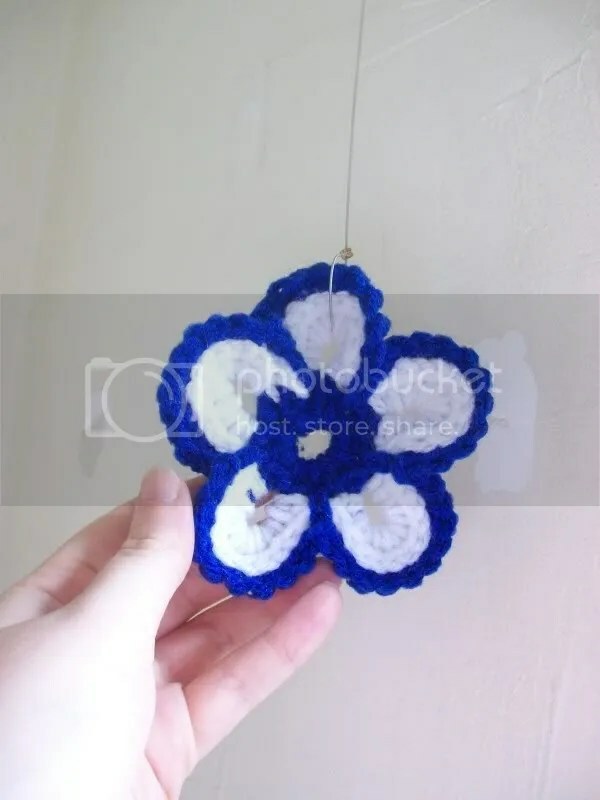 I decided to just make the circle chain longer in order to better accommodate the full six petals (duh!). While it’s still slightly squishy, but less so than the first one, I like how the petals overlap and stay pretty much flat after I blocked it overnight. You can expect to see many more of these flowers here over the summer, as well as more butterflies, which I will probably make soon.